Little by little my Red Rose Farm quilt is coming along. I've been auditioning sashing fabric and measuring and trimming and playing with the arrangement. I just love this fabric. I have tried to utilize as much of the fat quarter bundle as possible and I do believe that when this quilt is all finished, I will only have tiny pieces left. I love that! The kitchen chorus (as I like to call them) really make the quilt for me. I know that whenever I see this quilt hanging in my kitchen, I'm going to smile. My machine has been in the shop for almost two weeks. I needed to sew terribly so I went and found the machine we bought for our daughter when she was in elementary school (she's in highschool now). It sounds like a truck is coming through the house when I use it but it sews a straight, quarter inch seam and that's all that matters to me. The colors in the quilt are beautiful. I think it will make a wonderful addition to your house. 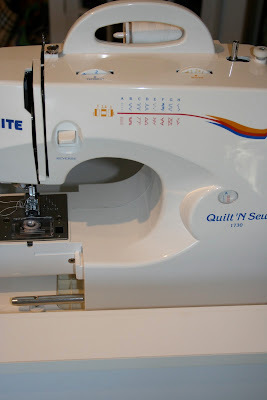 A friend of mine has a sewing machine that sounds like a machine gun! It's looking beautiful...keep up the good work! I can't wait to see if finished! Hey as long as it sews who cares what it sounds like right? Love the colours of your quilt. 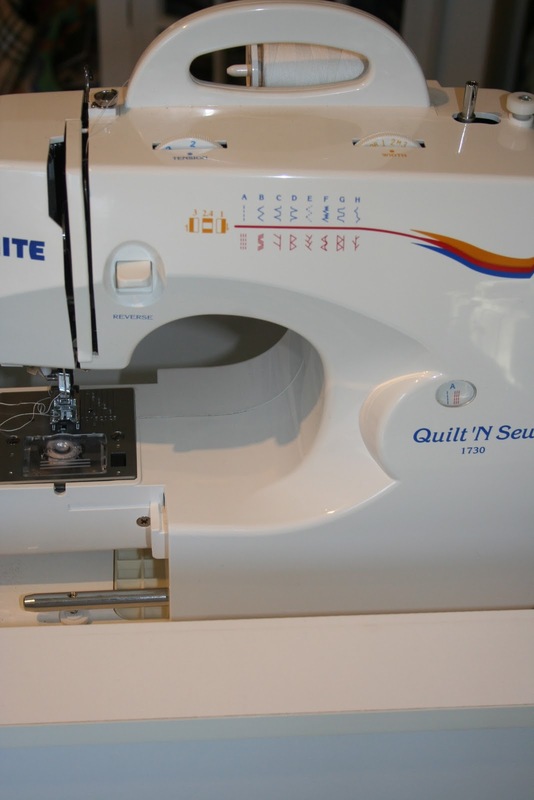 My machine is in being fixed also and had to borrow one as I didn't want to loose my sewing momentum! Oooh I really like this one. Such a happy-looking quilt! Oh! What a cute quilt! That will look so sweet in a kitchen. 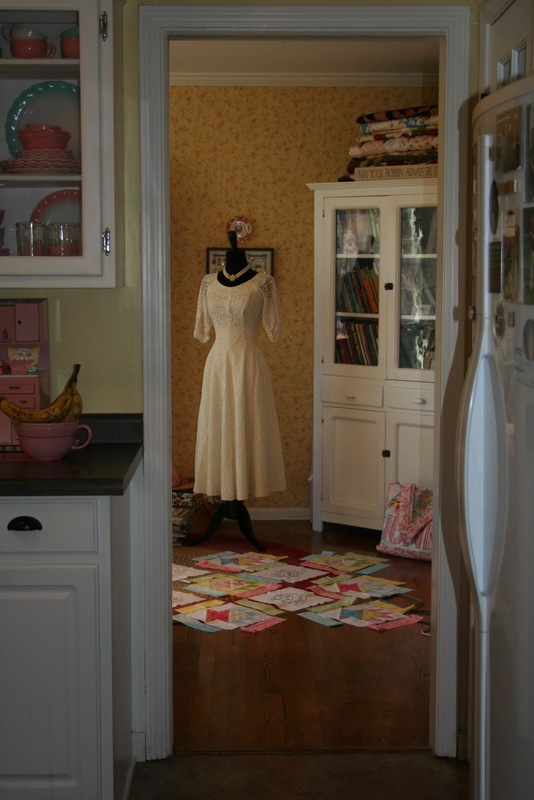 I have to say, "I was swooning over the photo (showing a bit of your kitchen), leading to your sewing room. SOOOOO pretty!!!" At first I thought that was a rug on the floor. Your colors in your new quilt to be are so cheery - love it! I agree with Sue's comment (above) I would love to see more of your delightful home. And, you have joined my "Sounds like a truck coming through the house" club. And, yes, the blessing of a straight seam. Tell me about Stash manicure- looks interesting. It looks beautiful...I haven't even taken mine out of the packaging. I have so many projects started and want to devote some time to using the beautiful fabrics in just the right project! I love your happy place. Love the colors wish I had the ability to sew !! I love you pics here in this post (well and all of them) super awesome!